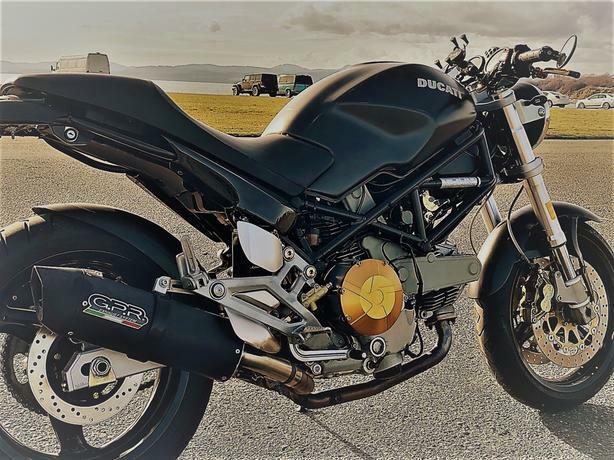 I have for sale my tastefully modified and beautiful Matte Black Ducati Monster, 618cc. This bike is an exceptionally nimble commuter with some get-up to get around the city of Victoria. The Duc' is immaculately kept (I get lots of comments) and in excellent shape with UNDER 10,000kms. Why so low? I brought it over on the back of a truck from High River, Alberta (where you can ride about ten days out of the year) about 2.5 years ago. I work out of province and haven't ridden as much as I would like. This monster has received regular service throughout its life. I recently brought in to Adrenalin Motorcycles in Victoria (March 13th 2019) for a fresh oil change and a chain-clean & lube. They gave it a thumbs-up. The bike was serviced regularly with a cam-belt replacement at 5000km. I also replaced the fuel filter under 1000km ago. I also have most stock components including the original REMUS mufflers, headlight, an extra battery, a carbon fiber front fairing, side panels, aftermarket handle grips, etc. Why am I selling? I don't really want to. I need a new truck and we've just purchased our first home.